Below are some installation tips helpful for Gamiviti products. If you find you need more help or have additional questions, use our Contact Us form to get in touch. Prior to installing your rack you must first remove your old one. This is a well-documented process and you should be able to easily find info on this specific to your vehicle, here are a few tips we have found to be most relevant and worth adding here. Squirt penetrating oil onto the screw heads for several days prior to removal. Once removed, you can put smaller bolts back into those same holes, using some silicone (see below) and rubber sealing washers. You only have to remove the long raised rails on the sides, you don't have to remove the thinner rails that are secured to the roof in the center. On the 80 series, if you're running 45 degree towers you actually don't have to remove anything, however it makes using your new rack a little easier if you get that old one out of the way, regardless of the fact that it will clear it. Looks better too to just have one rack. You will need to find a T-30 Torx driver for LX models, 12mm for Land Cruisers. Either way, you won't use those bolts again, and you may not ever use that T-30 tip again... chance you got one with that cheap set of screwdrivers and/or drill attachments you bought. on LX models, they didn't put a bolt in the forward location of your center towers. So there is going to be a bunch of dirt in there... when you get the rack off, squirt some lube in there, then run a bolt down with nothing on it. better yet, run a M8 x 1.25mm tap down there to clean those threads up, otherwise it's possible to bugger this one up when you install the rack. The 1" wide rubber strip can stay on, if you are going from a 3-tower per side factory rack to a 3-tower per side Gamiviti rack. But it won't keep all the needles and water out of that channel, there will be a gap around the towers. So we think it's better to just pull that rubber thing off, regardless of rack, that way you can visually inspect what's going on up there periodically, and keep the area clean. Probably the best tip on removal is go slow, and slowly ease out both bolts at the same time. Inside your roof is a little backing plate with 2 nuts on it, held in place by these little plastic sleeves around the bolts, and a small retainer clip. If you are too aggressive with a bolt (like pushing down) you can dislodge that plate, then it will be swimming down in space below your roof above the headliner. This isn't the end of the world, but it can slow down the process. To deal with a plate that has come loose, first remove all tower stuff completely so you have a clean roof surface. Then take one of the M8 bolts and try to thread it into one of the nuts- you may need to run to the store to buy an even longer M8 bolt if it's way in there, or possibly use a poker (coat hanger, skinny screwdriver, etc) to move it around, again the thread is M8x1.25 if you need it. But once you get one side started, you can use that bolt as a handle to get the other side into view, at which time you thread another bolt in there. The goal is to have bolts in both sides, then add the tower. So once you have bolts in both sides, remove one of them, then reinstall the bolt now running through your tower. Once one side is started, then do the other side, then slowly work both bolts in until the tower is secure. The 1" wide rubber strip really has nothing holding it on. It was smashed in place by the factory towers, but with those out it will just fly off if you don't remove it now. Most people don't try to retain those, instead just run a clean channel. Here are two photos photo showing the channel tower setup for a basic rack setup without a light bar dropdown feature. Racks that have either the tapered Expo or cut-style light bar drop down will want to run the front at the highest setting . Note that the middle towers do not have a small 1/4-20 bolt, this is only necessary in the front, to insure the rack is level with the vehicle. To make installation of the towers at the back of the sunroof easier, position the top portion of the tower behind the base of the tower. This will shift the top of the tower towards the inside of the roof more, and make it easier to get that inside bolt started. Remember to place the towers on the vehicle first, then lift the rack onto them. Put all of the bolts through the rack into the towers before adding the washers and nuts. Once the bolts are all in your desired location the nuts can be added and secured finger tight. When tightening the rack, start with the inside top bolt first (securing the tower to the rack) followed by the outside rack bolt. Second, tighten the middle bolts that hold the tower together. And finally, tighten the bolt going into the roof of the vehicle last. Note: on models with a Light bar drop-down, or tapered Expo bar, and racks with 8 towers, start with the lowest possible setting (or no bolt) in back (no adjustment bolt at all), and the highest possible setting in front. This is a good safe starting point to guarantee clearance across the front of the windshield, as it's close. Once you get it snugged down, you can consider lowering the front tower to dial in the fairing clearance... tighten the middle towers at the end, once you have already set the final height. Start by putting the towers together, see the above picture for a guide. For non-drop down racks, try the front towers do the 3rd highest setting, the back do the second highest, that's a good start. The middle don't use the center height bolt, just put it together as low as it will possibly go. Note how the front tower has the top that goes in front of the bottom, while the back tower has the top part behind the bottom, that's to help compensate for the taper of your roof. Note how the tower bases have multiple slots- it’s important to do this symmetrically, so the spacing between the towers is the same on both sides of the truck. On 200 series with 4 towers per side, here is a picture of all 4 tower locations. Note how the forward tower is as far forward as it can go, and the tower just behind it is as far back as it will go. Also note the location of the bolts going into the rack. Once the towers are in place, have someone help you lift the rack in place, and put all the top bolts through, the whole thing should be very symmetrical. To tighten, do the top bolts first, then the center tower bolts, then the bolts that attach the towers to the roof (or clamps, if using rain gutter towers). Last thing to tighten is those 4 height adjusters (channel towers only). Note there are only 1/4-20 bolts supplies with the channel towers, they are used in the far corner towers only to set your height. Fairings come in one size, and pre-drilled for a variety of applications. 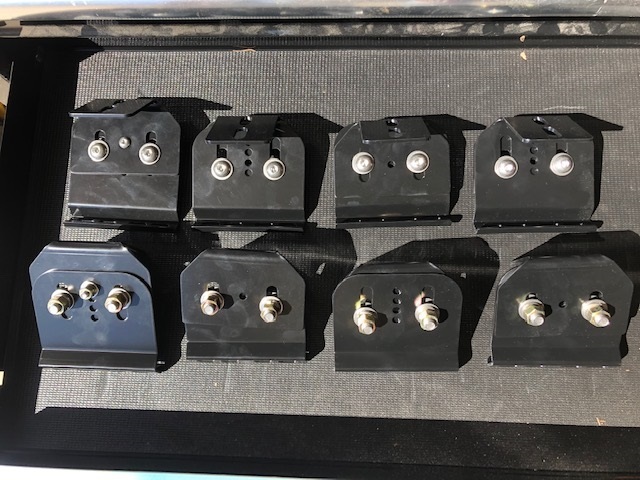 While most will bolt right up, on your application and level of customization it may be necessary to drill additional holes to get the mounting exactly how you like it. Given the wide array of vehicles, light tabs, and rack heights, this is to be expected. For bolt-on fairings, use 4 pipe clamps across the top of the fairing, to secure to the main hoop of the roof rack. The other two clamps install on the lower Expo bar, spaced about 12" from the center. These lower clamps do not need to be bolted through the fairing, they are mainly there to prevent vibration. One tip is to twist & force the fairing into the lower clamps while tightening the tops, to give the fairing a little more down force, however generally the oncoming wind is all you need here. If desired, you can drill holes through the fairing to secure the lower clamps, but this is generally not necessary. Check the bottom of the fairing relative to the roof of the vehicle- you want a minimum of 1/4” of clearance here… to adjust either raise the rack or trim the fairing. Trimming the fairing is easy- use a band saw or jig saw, place masking tape down first to use as a guide. Racks with fairings with the snap-on attachment will bolt theirs up using the supplied stainless clamps. Note how the bolt for the top clamp runs through the slot of the clamp, while the lower clamp bolt runs through the hole in the clamp. You can position the top clamps within the slot to adjust tension, also simply use your hand to bend the clips to achieve a tighter or looser grip to the rack. For racks running the “flip up” fairing, you will need to drill two more holes through your fairing if you wish to run the metal clips around a drop down, or tapered Expo bar. It is quite easy, just use a carpenter’s square to locate 4” down from the flat edge, doesn’t need to be perfect as you will use the slotted area of the metal clip anyway. Pick any drill around 1/4”, then adjust the clip to your desired tension. Lots of content relative to awning installations, please see this page for information specific to awnings.